From the high seas to strange histories, from dystopian milieus to galaxies that cry, we invite you to explore the rich landscape of Finnish speculative fiction. 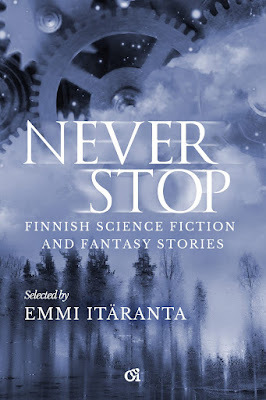 Never Stop brings you fifteen diverse stories from up-and-coming Finnish authors. Humor, hurt, love and loss. Spaceships and science. Old lore reinvented. Never Stop, a collection of Finnish science fiction and fantasy stories, will be published officially today. The book launch party will be today 8 PM in Talvipuutarha at Helsinki fair centre. Further details about the event can be found at the book launch Facebook page. See you there!